Back in 2010, I wrote on film adaptations of Sense and Sensibility, specifically asking (and noting) how various films treated Marianne Dashwood’s pianoforte. It has always bothered me that I scoffed at the idea of the piano being moved from Norland Park (the Dashwood estate now in the hands of their half-brother) to Barton Cottage by water. How could something so delicate (in my mind) be subjected to (perhaps!) a watery grave? A new-to-me book, Mr. Langshaw’s Square Piano, by Madeline Goold, brings home just how ingeniously-constructed these early pianos were. She purchased at auction an 1807 Broadwood “box” piano. This probably was the type of pianoforte the Goslings sisters first learned to play. 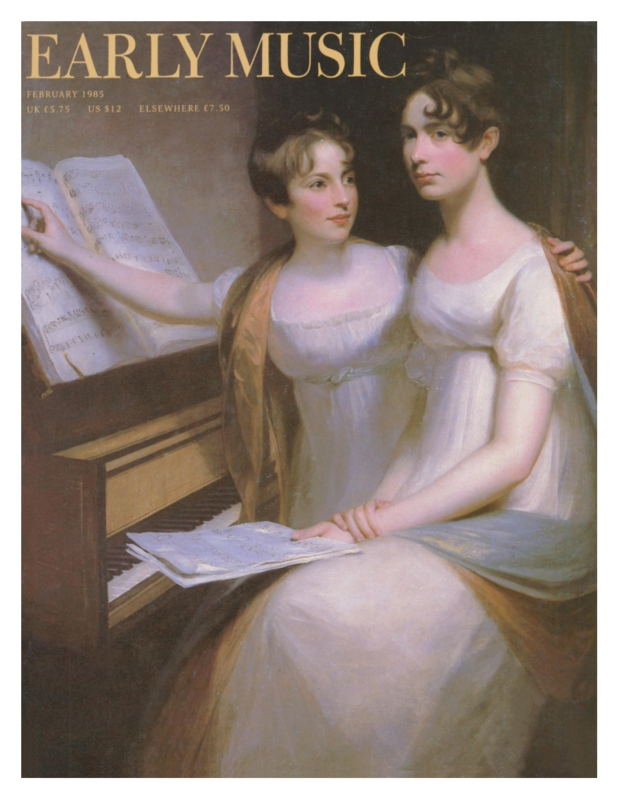 I’ve mentioned elsewhere that this Beechey portrait (below), identified as the Coventry Sisters, is VERY like the description of the Beechey portrait (still “missing”) of Elizabeth and Mary Gosling. The piano, though, is what we want to pay attention to in this portrait. And that brings me back to Goold’s pianoforte. When she first found it – in “complete” condition (unlike one that was a hollow shell, latterly used for chickens!) – its legs were laying beside the keyboard’s “box. I certainly NEVER thought, when contemplating the removal of Marianne Dashwood’s piano, about disassembling it to the point of removing its legs, packing it in a deal box (a “box” within a box, if you will), thereby making it not only portable, but highly stable. Can’t tip over if it isn’t standing upon its legs, can it? Goold’s book (which isn’t new – published in 2009) highlights the fascinating history of her auction purchase, and how she put together that history. I, too, have wished for a bit more of the backstory (even as an appendix) concerning the two-year restoration her Broadwood No. 10651 incurred. Goold’s story of the almost-accidental discovery of the pianoforte, in the early chapters, really spoke to me; so many of us would have loved to have made a similar discovery. In March, 2017, I attended an Austen symposium at SUNY Plattsburgh, a Bicentenary Celebration of Art, Music, Austen. This was a wonderful gathering. Small and intimate, presenters made up a good deal of the audience. A FABULOUS mini-concert by mezzo Meagan Martin (with pianist Douglas Sumi) which presented her commissioned piece, “Marianne Dashwood: Songs of Love and Misery”. The weekend ended with an optional tour through Plattsburgh’s Kent-Delord House – and there, against the wall in one room, was their box (or square) piano. Alas! the vagaries of too many winters & summers had been quite unkind to it. Our docent pronounced it unplayable. Which was not to be the case with Goold’s auction find! A sad fate for so many; a happy fate for too few – such as the Broadwood No. 10651. The book includes information on the Broadwood business (the glimpse into their sales books is highly interesting), as well as the titular “Mr. Langshaw,” a piano teacher in the north of England who helped supply pianos to his students. UPDATE: The blog Prinny’s Taylor posted in 2011 the “Adventures of a Pianoforte” which discusses (with pictures!) a restored 1809 Broadwood GRAND piano affiliated with author Charles Bazalgette’s ancestor, Louis Bazalgette. A fascinating use of the old ledgers of the Broadwood business. The Bazalgettes were especially active in having their piano moved and tuned. I must admit that I never _thought_ about WHO was tuning the pianos in the Smith and Gosling family. They make mention only a couple of times; but I’ve never thought about following such a lead – and wouldn’t have without Charles’ post. In search of images by artist Thomas Onwhyn (c1814-1886), also known as Samuel Weller (under which name he did “illegitimate” illustrations of works by Charles Dickens), I came across a wonderful blog post at BOOKTRYST. Onwhyn illustrated his own version of a book I fell in love with when first coming across The Matrimonial Ladder (1825). Onwhyn’s version – called (surprise) A New Matrimonial Ladder – of the “tale” has charm, and you see above his deft handing of scenery (many of his drawings were published by Rock & Co., London), with the cliffs in the background. It is a hard choice – like choosing between the prettiness of Brock or the allure of Hugh Thomson when discussing illustrations of Jane Austen novels. The drawings of “M.E.” (above) have much in common with such delightful books as Mrs. Hurst Dancing (drawings of Diana Sperling) or A Picture History of the Grenville Family of Rosedale House (drawings of Mary Yelloly). I think you will enjoy BOTH (online) “books”.